You are here: Contests / Enter To Be July's Soldier of the Month! It's time! 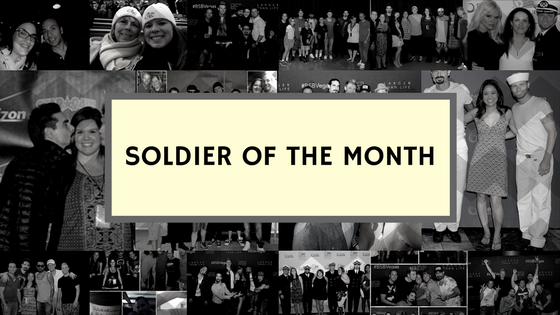 We're looking for one member of the BSB Army to highlight as July's Soldier of the Month. To enter, answer the following question: The Backstreet Boys have been a part of several television shows - from "Sabrina the Teenage Witch" to "Undatable." If you could pick a scripted (fictional) television show for the boys to be a guest star on, which would you pick and why? Make sure you answer the question in the comments section below and then click the 'Sign Up For This' button. You must complete both tasks to enter! Check back here in the contests section at the top of each month to sign up to be SOTM! - Must be a registered member of the BSB fan club. - Previous SOTMs are not eligible for two calendar years. After 24 months, they can enter. - All entries are subject to audit. - Winner is selected at random. There is this new show that I have watched recently and the show is "Suits." I get to see it from time to time. What I'd like to see is an inside look on how it went down with what happened with the boys and the hoopla with Lou Pearlman. Does not have to be the reality of it all but just a look at it. The show is amaze-balls. Before, I loved watching a lot of police and court shows and stuff like that. But for a while, I've been avoiding tv. I love Big Bang Theory as well. Got to catch a few episodes before. But anywzys, that is just an additional thought with one of the shows that will be cool for the boys to make an appearance on. If I had to pick a scripted television show for the boys to appear on I would pick Blue Bloods. I’d like to see how tough they’d be to be interrogated by former tour mate Donnie Wahlberg’s character Danny. And plus, who doesn’t like a bad boy from time to time? What about the boys taking part in Game of Thrones, dressed up as white walkers and secretly doing dance moves for “Everybody”? ?????? I would love to see that! The Big Bang Theory, as secret investigators disguised BSB, sent to watch Sheldon for doing something illegal on accident. Each one specialized on different areas. I totally see Kevin as the new professor or Sheldon's boss though. Them not knowing they are huge celebs and Penny being a big fan girl stalking them making it hard for them to do their investigations. What about the show, "Workaholics?" The boys love to laugh, tell jokes, and prank each other while having fun doing what they do. Episode 272 (bsb) Frack without the frick would just be kaos. Psych! Pineapples, Magic Head, musical episode...awwww yeah, son! Will and Grace just because it’s my favorite show and they have the best sense of humor so they would be willing to do anything.